After seeing the preview for the upcoming movie District 13: Ultimatum, I couldn’t help but think about how amazing the stunts looked and found myself wondering what the training would be like. The “stunts” are from a discipline called parkour, in which a person goes from one point to another in the most efficient way possible, all the while adapting to the environment. That could mean anything from running, jumping, crawling, vaulting, climbing, etc. You’ve seen feats such as this in other movies (i.e. “Casino Royale”), online videos, and video games and they are usually very advanced. It would take a great deal of time and training to be able to do those stunts, but some measure of parkour efficiency can still be achieved with training. I came across parkour years ago indirectly through movies and online videos. After hearing about the upcoming movie, I searched where we all go to look up groups–Facebook–to see if there was a parkour group in Austin I could try out. A few Facebook messages later, I met Matthew Willis and Levi McGlathery at Waterloo Park, where they hold an open workout for free every Wednesday evening. The workout usually lasts an hour, sometimes longer, but anyone is free to come and go as they please. When the last of the stragglers arrive a little after 6:30pm, the workout begins. The group is made up of mostly young men, but we were told that women come to the trainings as well and that they even have a 60-year-old member that drops in from time to time. Matt begins by leading our group of about 15 people in some static stretches, which gradually lengthen the muscle by holding the stretch, and dynamic stretches, which use movement, momentum, and muscular effort. We then line up on top of some steps that range from a few inches off the ground to a foot and a half off the ground. The beginners (like me) line up along the lowest points, with the more advanced traceurs, as practicioners of parkour are called, further on down the line at the higher steps. Before we begin our training, Matt, who comes from a gymnastics background, gives us a brief instructional on jumping and sticking the landing. Making sure that we land properly is an integral part because a controlled landing is essential in keeping the movements as fluid and efficient as possible. He then has us jump across the path in as many jumps as we require, working our way to only one or two big jumps to get across. The whole time we are told to make our landings as quiet as possible and make sure we are not powering through the jumps. As the class progressed from easy to more advanced jumps and stunts, I had to take a step back and just watch. 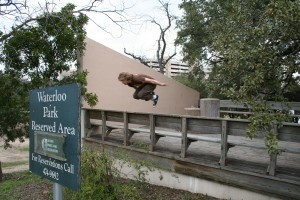 The more advanced members of Parkour Austin would do a few jumps and then show others the progression that was used to accomplish them. While talking to Matt and Levi after the class was over, all of the students stuck around longer to teach other and talk about what they just learned. Although Matt taught the class in a very lighthearted way, he still managed to keep us on task and injury free. I really enjoyed the class and the way in which it was taught and I totally expect to go back. I found myself sore everywhere the next day, but I actually enjoy that feeling. I had worked out in a way that I hadn’t done in a long time. Parkour is a very plyometric-heavy workout, meaning high intensity training techniques are used to develop strength and speed, that focuses more on fast twitch muscles (e.g., used in jumping) rather than slow twitch (e.g., used in jogging). When it comes to getting in shape, it is definitely a fun alternative to jogging or lifting weights. 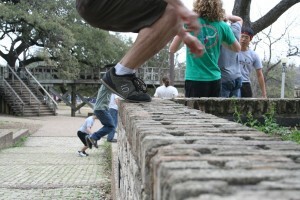 The focus of parkour is on efficiency and speed. This discipline does not want to exist in the competitive realm, as it would take away from the personal responsibility and self-development aspects. “Each one teach one” is the unofficial ethos for this non-profit group. They train and instruct parkour so people can learn and teach others about parkour. Being able to introduce and incorporate people of all ages and walks of life to parkour is worth its weight in gold to this group. 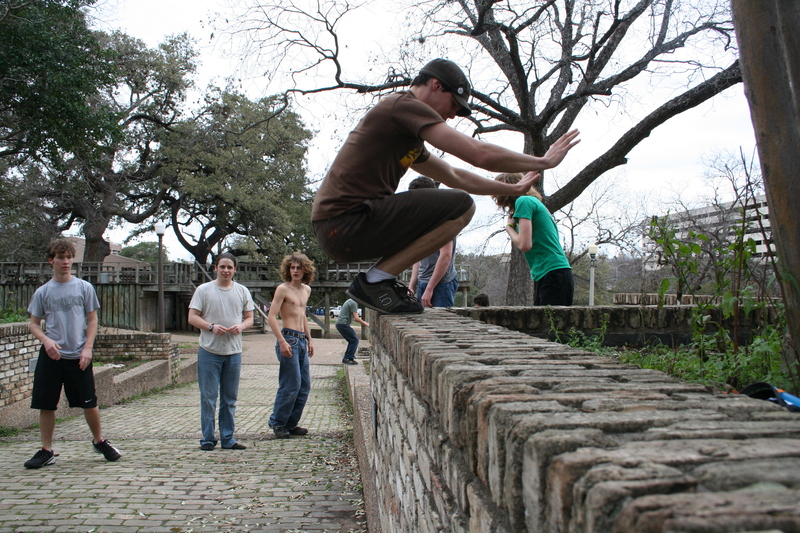 In addition to the free class offered on Wednesdays, Parkour Austin also holds an open gym in Buda on Mondays for $5 (to cover insurance) and a free 9am Saturday training session (location varies). 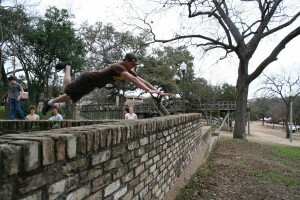 For more information on Parkour Austin, go to http://www.texasparkour.com/ or look the group up on Facebook, like I did. As always, if you would like me to cover a specific topic, please feel free to email me at rgonzalez@theaustintimes.com and please consult a physician before starting any exercise program.